That pizza sounds wonderful. I love apples and cheese….actually I love fall. Or well the idea of fall since I am still in shorts, flip flops and tank tops. I am not amused. I am definitely not asking for snow here but getting out of the 90’s in (now) November just doesn’t seem like too much to ask! As for trick or treaters…I blame parents. My parents would have NEVER let me do that. Thankfully last night we only got really young children all in adorable costumes. My favorite was a little boy dressed up as Thomas The Train and he said “thank you” about 50 times to me. His mom laughed and said they had been practicing. It was adorable. holy moly. I need this for dinner… seriously. this one time. my roommate and i thought a package of “Blueberry Apple Cinnamon Spicy Sausage” sounded like heaven at whole foods. we decided to try it by itself and just cooked it through, i think with some scrambled eggs on the side. Sickest sausage I’ve ever had. Maybe apples go with sausage…but blueberries do NOT. BUT- Can bacon go with blueberries??? Holy yum! The other night as I was falling asleep I was trying to figure out how to put apples on a pizza without the hubs noticing. My local brewpub uses bacon and blue cheese which is delicious too but you get bonus points for making this feel and look healthy. I’ve never lived anywhere where we got trick-or-treaters, but I always wanted to. Now I am not so sure. I’m not afraid of little boogerheads, nor am I even particularly fond of them. I would take PLEASURE in telling the ones without costume to get lost. I’m totally pinning this. RIGHT. NOW. Because Bacon is my love. No wait, gouda is my love. Except for caramelized onions which should be on EV-RY-THING. I make pizza once a week, and am always SO excited to have new ideas. Apples??! On a pizza?! Yesssssss. Wow, that pizza looks delicious! Yum, yum! And I can totally relate with the trick-or-treaters! We had similar observations last night! Delectable. And I commend your (not-ruthless-enough) commentary on costuming and halloween. But mostly, I wanted to say that you have a really great sense of food styling. All the pictures are appetizing and beautiful, especially the one with the pizza cutter. Good job! And again, yum! Yeah that’s just plain genius. I know if I made it it wouldn’t look so amazing but that doesn’t really seem to make me want to stop….. This looks awesome! And you throw as much sage my way as you can – I have plenty! :-) ps. made your Butternut Squash and Sweet potato lasagna this weekend and I totally loved it – can’t wait to make it again! thanks for the great recipes. I don’t think I would have ever thought to put apples on a pizza, but I don’t think I’ll be able to get this out of my head until I make it!! This pizza has fruit on it, it’s healthy. So, uh, I’ll just be taking the whole thing now…. Bacon, apples and whole wheat flour….this is downright health food. Looks delicious!! This pizza looks incredible!! but….you gotta give us a recipe for the fried mac and cheese! I just about passed out when I read that someone came up with a combo of 2 of my favorite things. I’m not positive if I will make it or not, but I can email you the recipe if you want? yes, please! sounds like a good twist for our thanksgiving mac-n-cheese this year! I love the pizza! That would be so good!! I’m not good with pizza dough, so I am going to try your recipe,however could you make it in advance and have it the next day? I want your pizza for dinner, but I don’t have enough time for the rise to make it when I get home from work. I saw you are on the guest speaker list at the Foodbuzz Festival this weekend! Thats awesome! I wish I could go, but it’s for invites and sponsors only. I would of loved to see Tyler Florence cook, he’s my favorite, not to mention so cute!! That seriously looks like heaven. You crack me up. That pizza looks fantastic. Maybe I will make it, but I’d rather someone else do it and just serve it up to me. I totally agree with your halloween observations. Our neighborhood was so lame. I used to see costumes worthy of a cute photograph, but not this year. I’m left with a whole bowl of mini milk duds & rollo candies. Any ideas? The pizza looks perfect, even thou I will have to exchange pork for chicken/turkey processed products. NOW, could you give some pointers on getting an almost 11yr old boy and his crusty father to eat this? Hints or tips, I need them. Such an original idea! i love the use of the apples, such a great fall ingredient and I love finding new different ways to utilize the ingredient in other ways other than desert! Made this last night after reading your post…verryyyy good :-) Love the blog! Mmm, I love making homemade pizza. This seems like a fun way to switch things up for Autumn. Uhh, that looks AMAZING. I’ve never made homemade pizza before, but you’ve inspired me to try it. Also, I’m pinning this, immediately. That pizza looks incredible girl!!!! 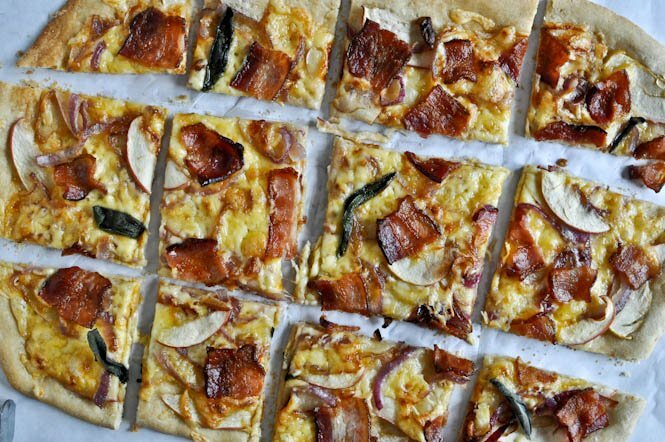 I love apples on pizza – they are great with pulled pork, but, I haven’t had them with bacon! I am excited to try this. This pizza looks and sounds beyond delicious!!!!! Must make and eat ASAP! That looks amazing! You have really beautiful photos! Made this pizza today! I used pre-made pizza dough but it still counts, right…? It was delicious! The sage was a great idea and the cheeses worked so well together! What a recipe! I have been looking for ideas to use the apples we see all over the market at the moment. This recipe is a winner! I made it for my home syndicate meeting. I had great feedback. I used Cortland apples. Mine did not have bacon or sage and it did not feel that anything was missing. Although I am sure both ingredients are great additions. I put the oven on 425F as I worried 375F was not enough for pizza. It went perfectly. I am definitely tweeting about this recipe. Thank you. I have a lot of Gouda that we bought at our favorite place that makes it. Found a sale on organic Fuji apples. Check. Applewood Smoked Thick Cut Bacon always in our fridge. Grow our own sage. Check. Cupboard full of King Arthur Flour. Check. Pizza Stone. Check. Drooling all over your photos, this very pizza. It’s in the oven right now. Will post it on my blog soon, and will absolutely and definitely give you the kudos you deserve. PS: I sat in the front row of your panel discussion at Foodbuzz. I almost walked up to tell you how insanely good one of your cupcake recipes was to make. But, your fan base was more aggressive that I am. It was nice to see you, in person, and I can hear your voice when I read your posts. I always read every word. Love your wit and gift for recipe development! Thank you so much! I really, really wish we could have met! Thank you so much for coming to that panel and especially reading here. Means so much to me, truly. Pingback: Yum! » Share Food, Love Food » whole wheat roasted red pepper + fontina pizza with balsamic glaze. Just made this for dinner tonight and it was positively fabulous! Love your mix of healthy and delicious food–I find myself pinning about every one of them–and making a few of them as well. :) Also tried your butternut-stuffed shells, TO DIE FOR. Many thanks.